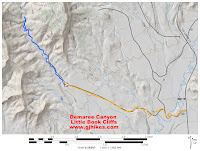 Demaree Canyon is locate in southwest Garfield County about 15 miles north of Loma, Colorado just off of Highway 139. The canyon has been made part of a Wilderness Study Area probably for no other reason than the ongoing feudal contest between industry and environmental groups to lock up as much land as possible to be under their control. Deer, elk, bear, bobcat and mountain lion can be spotted within the canyon or their tracks at least. Approach: There are enough dirt roads in the area that finding the mouth of the canyon might be challenging without a little guidance. Measuring your distance from the intersection of Highways 50 and 139 at Loma drive north on 139 for approximately 15 miles. The turnoff on the west side of the road is just before the Mile 15 mile marker. After crossing a cattle guard the road passes on the left side of a small hill between it and a stock pond. Follow the road around the hill passing between the hill and a corral. The road drops down into a wash and crosses East Salt Creek. If you are driving a low clearance vehicle you can park here or anywhere around the road to begin hiking. Some people park here and mountain bike to the beginning of the wilderness area. The spot where this hike begins is 2 miles from Highway 139 but it is easy hiking if you don't mind the extra distance. After crossing the wash continue west on the road through the sagebrush. Continue to the left at the next 2 forks. Both of the roads to the right lead further up Howard Canyon which borders the highway. After the second fork the road begins climbing a hill with some very deep ruts. We made it up the hill in a jeep in 2-wheel drive and also a small 2-wheel drive Ford Ranger. Narrow wheel bases work the best because they can avoid the deep ruts. If you have a large vehicle you may have to use 4-wheel drive just for this one spot. At the top of the hill the road forks again. Follow the road to the right that angles in almost a straight line to the mouth of Demaree Canyon. If the road is very wet come back another day. A good place to park, if you decided to drive this far, is right before the Wilderness Study Area marker at the mouth of the canyon. There is an old fire ring of rocks beside the road just before the sign if you are looking for a spot to camp. The road continues into the canyon making for a nice double track hiking trail to where it ends at a wash where there is another sign that further restricts travel into the canyon to hiking and horseback only. To continue up the canyon you will need to drop down into the wash which is about 10-15 feet deep and climb out the other side. After crossing the wash there are still indications that at least wagons had once continued further up the canyon. This canyon may have been used in times past as a route over what is now the Douglas Pass area. There are still dirt roads to this day along the top of the canyon that run between Douglas Pass and the Baxter Pass area. If you have ever driven around that area then you probably know that you can get to Rangley, Colorado or even the Vernal, Utah area if you know which roads to follow. With a little searching it isn't too hard to find a good variety of plant fossils. That is true, of course, for anywhere you are hiking in the Little Book Cliffs. We conspicuously placed specimens along the trail for future hikers to investigate. The wash becomes the best path to follow for part of the hike. The Douglas Pass area of the Book Cliffs produces many, many seeps. Water that comes down Demaree Canyon drains into East Salt Creek. There aren't a lot of signs of flash flooding but they probably to occur. For the most part the wash can be avoided and as long as a person isn't foolish enough to actually camp in the wash flooding shouldn't impose any great risk. Never, ever, ever camp in a wash no matter how dry it appears or how clear the skies seem to be. Flash floods can travel from miles away beyond the horizon. You can continue hiking up Demaree Canyon to your hearts content. 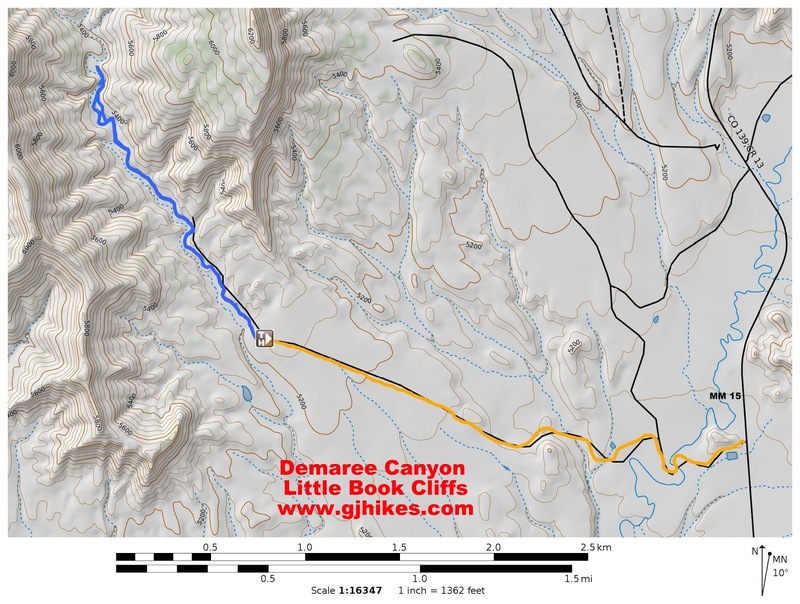 It would be interesting to backpack in and hike the full length of the canyon to Douglass Pass. Who knows what interesting things might await the adventuresome hiker further up the trail. If you would like to see it for yourself then all you have to do is 'Take a hike'.